About 300 residents from 10 informal settlements in Khayelitsha and Delft marched to the local municipality offices in Ilitha Park on 21 October to hand a memorandum to the City of Cape Town highlighting their complaints over a lack of service delivery. Carrying placards reading ‘We are not yet Uhuru, lets fight together’ and singing political songs such as “uMshini wam'” and “Sohlala sinyova” (we will always protest), residents said they were sick of the bucket system and demanded flush toilets before next year’s elections. They also demanded the electrification of informal settlements and the provision of piped water and roads. Chairperson of Abahlali baseMjondolo – the shack dwellers movement – Mzonke Poni said a memorandum was sent to the City earlier this month which noted their concern that people living in informal settlements were ignored and their rights were being undermined. Poni said informal settlement residents should be recognized as legal and not illegal occupants, as their lack of security regarding tenure allowed the government to forcibly remove them to “dumping sites”. Poni said Abahlali opposed the DA’s housing policy of one-plot-one-house as it was an apartheid strategy and forced a lot of shack dwellers to relocate far away from the City centre. “No house! No land! No vote!” he said. Lindela Park resident Mbuyiselo Marawo, 30, said he wanted to be removed from Lindela Park in Khayelitsha Site B because tuberculosis was rife in thre and he feared he and his family would be infected. He said sewerage pipes were not working and there was a rodent infestation. Marawo said if the City did not move them the shack fires and seasonal flooding of shacks would continue. Bothandwa Gamatana, 29, from UT Section in Site B, shack dwellers wanted a rapid response from the City or they would block the roads with burning tyres and burn municipal vehicles. “They are living in luxury because of us, why do we deserve the worst? We are sick and tired of sleeping in boxes, people are dying,” said Gamatana. 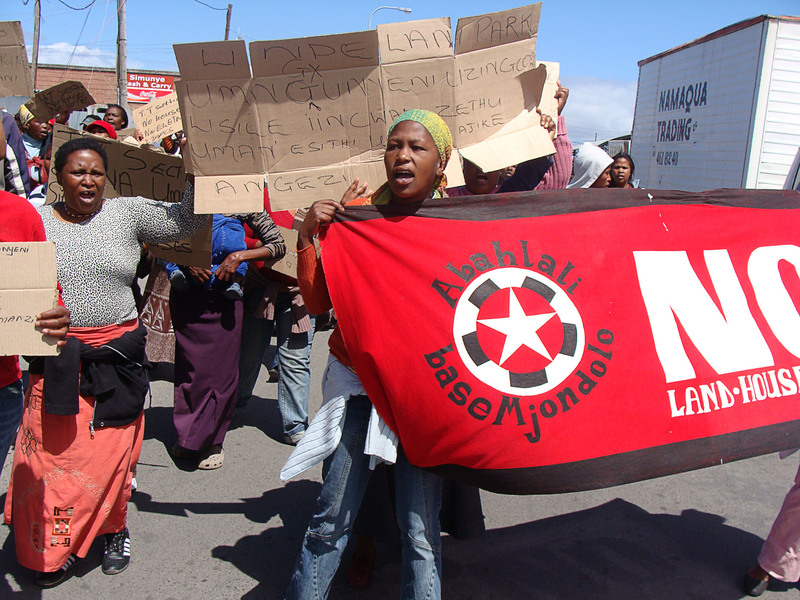 Western Cape Anti-Eviction Campaign Coordinator Jane Roberts said they supported the march in solidarity with Abahlali because city councillors needed to start delivering services to the poor, as people needed “decent” houses. Although Poni said demanded the City’s respond within the next seven days, media and communications person in the office of the mayor, Bonginkosi Madikizela who received the memorandum in mayor Helen Zille’s absence, could only promise the baying crowd that he would pass the message on swiftly. * Reporting by Brenda Nkuna. Great article. Great to see some independent news here in Cape Town.